A. M. Dunnewin grew up with a taste for mysteries and thrillers, inherited ever so lovingly from her family. An affiliate member of the Horror Writers Association, A. M.’s own stories cover a wide range of genres that tend to take a dark turn when least expected. With a B.A. in Psychology, she’s a gambler of words, obsessed with chai tea, and addicted to books – everything from classical literature to graphic novels. Other hobbies include art, history, music, equestrianism, and a good classic film. She currently dwells in Northern California. 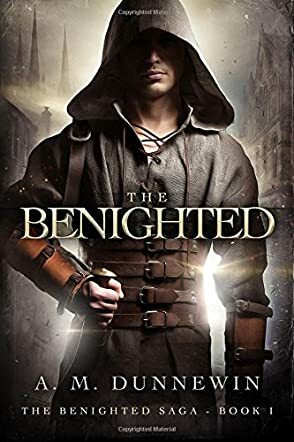 In The Benighted, the first book in The Benighted Saga by A.M. Dunnewin, twenty-three-year-old Skylar Mandolyn finds herself named heir after the tragic death of her brother. As the final heir, her existence is both an asset to the kingdom and a threat to those hoping to see its destruction. When her father is found murdered by assassins not long after her brother, instead of becoming queen, Skylar is imprisoned for helping her knight Harlin, who has been framed for the murder, escape. With her only hope being the knight who has gone missing, Skylar refuses to yield to the enemy, both foreign and those lurking in her own court, and must find the strength to oppose those determined to break her spirit through torture. Jumping between Skylar's present day situation and the past events leading up to it, Dunnewin manages to find the perfect balance in telling a story through flashbacks. It doesn't feel gimmicky nor does it bog the story down. I did wish the romance between Skylar and Harlin was emphasized a little more, but it has a subtle sweetness to it and I thought seeing Skylar grow and mature from a reluctant queen to a determined ruler was a satisfying alternative. Dunnewin crafts a fast paced, thoroughly enjoyable tale that has a slight steam punk bent thrown into the fantasy. It makes the setting of knights and princesses somewhat unique and is sure to grab readers' attention. The Benighted, the first book in a new fantasy series by A.M. Dunnewin, is great for fantasy fans looking for a quick read. I must admit it. No matter how I try to squash it. No matter what lovers do to kill it. No matter what I do to myself to kill it. There is an undying romantic and idealist inside me that refuses to even surrender, let alone die. Most of the time he is silent, but occasionally, he demands that I acknowledge his existence. So, I find myself searching for that perfect girl. Most of the time I settle for the perfect romantic novel. He must settle for that for now. It’s all I have the time and energy for. A.M. Dunnewin's The Benighted, the first book in the Benighted Saga, perfectly fits my romantic need. For some reason, I kept recalling The Bodyguard movie that starred Whitney Houston and Kevin Costner. There is just something about a beautiful woman whose life is threatened by unseen foes, and a handsome, capable, quiet guy determined not to let anything happen to her. Nine times out of ten it will lead to passion. Maybe I need to hire on as someone’s bodyguard. The Benighted by A.M. Dunnewin is in fact listed in the General Fantasy genre. It takes place in a feudal, medieval culture and is full of the expected strife those cultures bring. I love this setting and this kind of culture, but having said that the compelling point for me throughout this book, the reason I kept reading it and resented when I had to pause or stop was the oh so slowly developing relationship between Princess Skylar Mandolyn and her new bodyguard, Sir Brien, one of the fabled benighted. Watching this romance unfold is well worth the cost of the book, in and of itself. You get the kingdom saving for free. The Benighted is the first book in a series by A.M. Dunnewin, featuring murder, intrigue, and betrayal, one of those stories adored by fans of crime fiction and political intrigue. First they killed the prince, then the king, and everyone thinks it’s the knight, Sir Harlin Brien. The princess, Skylar Mandolyn, could inherit the throne, but she is now in prison for helping the murderer to escape. In her dark despair, she doesn’t forget the knight, framed for the murder of her father, but she is uncertain about her future. Her kingdom is under serious threat of war, and her enemies are as powerful and skilled as anything she could imagine. Only one hope is left for her — the return of the fugitive knight, and would he really be returning? A.M. Dunnewin is a good storyteller and begins this story with a great hook, a powerful description of a dream, and the reader immediately senses that something is wrong with the protagonist. The descriptions are very compelling and the language beautiful for a self-published book. The story line is wonderfully imagined and fast-paced; the author makes great use of flashbacks to create suspense, something that some readers may think is overdone, but it was fun for me. I enjoyed the way the darkness in the protagonist is explored, the inhuman treatment she receives, and her dark despair. The characters are well-developed and readers will easily find a place in their hearts to sympathize with the protagonist and the knight. Overall, The Benighted was a great read and one of the stories I wouldn’t hesitate to recommend to anyone looking for something dark and unconventional. A.M. Dunnewin’s The Benighted is a beautiful and gripping opening to a saga that explores murder and usurpation of power, and a woman’s struggle against injustice done to her family. After her brother and father are murdered, the princess Skylar Mandolyn, who should have inherited the kingdom, is imprisoned and treated with all sorts of indignities for helping a knight framed for the murders to escape. She knows Sir Harlin Brien didn’t kill her father. Now she is in no position to help him clear his name and there is no hope of escape for her, only the thought of the knight on the run. However, there are surprises she hasn’t considered and Sir Harlin Brien could be the last piece that will unravel the mystery. Is he returning and how would it be possible? You’ll love to find out. The Benighted is dark and raw, the kind of story that isn’t written for the faint-of-heart. It is filled with a lot of darkness, and oh the awful things they do to her! It is impossible to read this book without loving the protagonist, not because she is extraordinary, but because she is sculpted from loyalty and resilience. She suffers a lot physically, but breaking her spirit isn’t easy. The plot is fairly paced and the writing is good — although an editor could have dealt with some of the small errors that occasionally come up in the writing, but these are not significant enough to have a negative impact on the reader. There is a lot to love in this novel — the compelling plot with twists, the biting suspense, the intrigue, and this sense of pervading danger that punctuates the entire work. A.M. Dunnewin has the gift for a good story, a great entertainer. Skylar, the main character of The Benighted (The Benighted Saga Book 1) by A.M. Dunnewin, is in bit of trouble: after her father - the king - has been found dead, she is the only legitimate heir to the throne. Unfortunately, she is held prisoner unless she agrees on marrying someone whose family would like to gain power by marrying into the royal family. Skylar resists, even when she is tortured, and holds out hope that Harlin, her assigned protector, will return and save her. There is more to Harlin, though, than she thought, and whether he will be able to help is another question. I picked up The Benighted by A.M. Dunnewin because the cover of the book caught my eye. It evoked ideas of adventure, fantasy, noble heroes with some secrets, and intrigue. I know, you should not judge a book by its cover - but isn't that what we all do? Fortunately, the contents of the book gave what the cover promised, even though I would have liked to see more of Harlin as I liked him better than Skylar (to whom I could not find any kind of emotional attachment for a while). It would have been interesting to see things from his perspective. I enjoyed the plot but I found some scenes too long, with too many descriptions that made the plot progress a bit too slow. However, other readers might indeed appreciate just that - you can't ever get it right for everyone. The writing was flawless and made you understand where the heroine's actions and thoughts were coming from. I would definitely recommend this to people who enjoy intriguing fantasy tales with a female main character.